Learn how to maintain a stable reef aquarium by understanding the importance of your water levels and how to dose properly. When a new tank is started it needs to have some waste added to start the nitrogen cycle. This is accomplished by adding a small amount of food or other organic matter and allowing it to decompose. This cycle is the process of establishing beneficial bacteria that helps convert ammonia to nitrite and then nitrite to nitrate. Adding some form of starter bacteria is highly recommended to help quickly get through the nitrogen cycle. Ammonia and nitrite are both toxic to aquarium livestock and should be zero before adding livestock. Once the cycle is complete, they generally do not need to be tested often. Nitrate is waste and is not toxic when kept at low levels 1-5 ppm. Nitrate needs to be tested on a regular basis, generally weekly. When nitrates are above 5-10 ppm some form of carbon dosing is a good idea, but you must have a protein skimmer for this to work. This is not to be confused with running carbon in your filter system. With carbon dosing you add a food source (organic carbon) to promote the growth of certain bacteria in your water. As these bacteria grow, they will consume nitrates and phosphates from the water. Once they grow large enough, your protein skimmer will remove these bacteria along with all the nitrate and phosphates that was consumed. This topic must be researched before you begin just as you would any other aspect of the hobby. Water changes reduce all forms of non-desirables including nitrates and phosphates and if quality salt designed for reef aquariums is used, they increase the level of some desirable compounds that have been depleted. It is important to understand that water changes alone will often not bring undesirables like nitrates down to acceptable levels. They also do not replace the need for dosing of other desirable compounds that are depleted over time. This is because the reduction is in direct proportion to the percent of water changed. If your nitrates are at 40 ppm and you change 30% of your water, they will still be at 28 ppm. If your Calcium is at 350 and you want it at 450 so you change 30% of your water with water at 450 then you will just bring it up to 380. Dosing products containing beneficial bacteria can help to lower nitrates and phosphates and works well by themselves or in conjunction with carbon dosing. Incorporating macro algae to the sump system is also effective at reducing nitrates and phosphates. This process can be even more effective if an algae scrubber is added to the filter system. The general target level for phosphate is .025 ppm or below, but in some cases, it can be too low. Coral that is photosynthetic has symbiotic algae living inside it that needs phosphate as a nutrient to support photosynthesis. 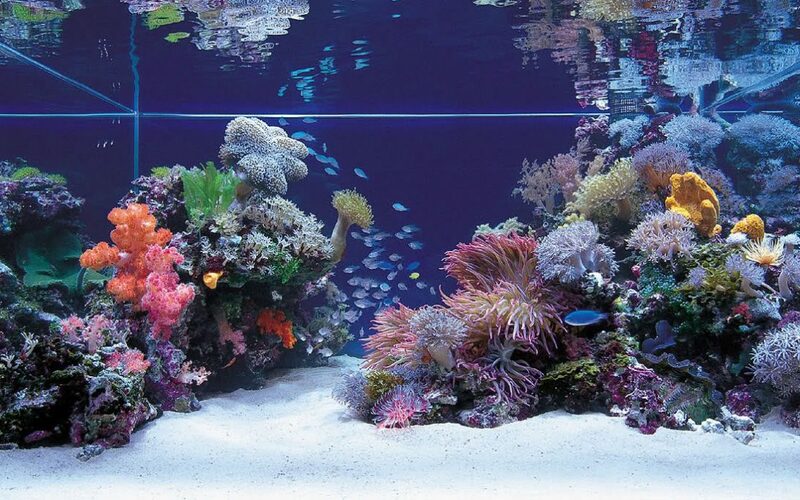 In tanks with very low phosphate it is beneficial to dose Amino Acid products as part of your coral feeding regimen. High phosphate levels inhibit calcification that is needed for growth of coral and coralline algae. It can also exacerbate nascence algae problems. Phosphate can be reduced through some of the same methods that are used to reduce nitrates including: Water Changes; Carbon dosing; Dosing beneficial bacteria; Adding macro algae or an algae scrubber to the sump; It can also be reduced with specific filter medias designed for this purpose, generally containing glandular ferric oxide. There are also a few products that can be dosed to directly reduce phosphates. These can be used for a quick reduction in phosphates, but other long-term methods still need to be incorporated. These are the most important components to measure and properly maintain it the reef aquarium. They also interact with one another, so balance is critical. KH and Alkalinity are used interchangeably. Kh levels should be maintained at 8-10 dKH. If KH is too high it can cause tip burning in coral and will cause Calcium to precipitate from the water lowering the calcium level and causing calcium buildup on pump impellers and the surface of other equipment. Eventually some KH dosing will need to be done to maintain levels in a reef aquarium. Low KH can be caused by excessive calcium dosing without consideration for its impact on KH and the acid released in the water by nutrients. If KH is too high it can be reduced by making sure the calcium level is not too low and by water changes with salt solution that has less KH. Red Sea salt (not the reef pro) has a dKH of 7.7. Proper calcium levels (440-450 ppm) are necessary for calcification of coral skeletons and growth of coralline algae. Protein skimming removes some calcium from the water, as does natural precipitation and use by corals and coralline algae. They will need to be maintained through dosing but remember they will need to be tested along with KH so a balance can be maintained. Magnesium should be tested and maintained between 1200-1400 ppm. Magnesium works along with calcium for rapid classification of coral skeletons and is especially important for the growth of SPS coral. Research suggests that higher levels can be tolerated and may be desirable in the reduction of certain nascence algae including hair algae. Levels above 1650 ppm can be detrimental to some invertebrates and should not be exceeded. Dosing of Magnesium may be necessary to maintain proper levels particularly in tanks where less frequent water changes are performed. Ph should be maintained as close to 8.3 in the reef aquarium as possible. Generally, it is not desirable to “chase” Ph until proper levels of KH and Calcium are achieved. Proper Ph is easier to achieve by taking steps to reduce Co2 in the water. Having a good refugium with macroalgae or an algae scrubber helps. Raising KK also raises Ph so if KH is at a proper level and Ph is still low there are a few products that are designed to raise Ph without raising KH that can be dosed. Iodine is utilized by corals for the synthesis of pigments, which allow them to adapt to varying light conditions and provide their tissue with protection from UV radiation. Invertebrates with exoskeletons, primarily shrimp and crabs incorporate iodine in to exoskeletons and require iodine for molting and forming new exoskeletons as they grow. Iodide is the most biologically available form of Iodine so when dosing, products containing this form of Iodine should be used. It is critical to test Iodide before and during dosing because high levels are toxic to aquarium inhabitants. Strontium works along with Calcium to maintain vigorous coral growth, so it is a good idea to maintain optimal levels. Trace elements are difficult to test, but still important for the health of your reef tank. It is recommended that conservative dosing of these components be performed especially in tanks where infrequent water changes are done.